The industry standard for over 100 years! Ever since the OHAUS Harvard Trip balance set the standard by which an industry would be measured, both OHAUS products and name have been recognised as among the most reliable in the business. Today our mechanical balances continue to provide solid, accurate performance and durability for long-term reliability. Whether you are looking for a sturdy balance for teaching children the priciples of mass measurement, a precision balance for the laboratory or you need a sturdy balance for tough environments, you will find the ideal product within the OHAUS mechanical family. Precision weighing - Up to 0.01g readibility, magnetic damping to prevent oscillation and precision engineered metal beams for accurate poise positioning"
Favorites in classrooms and industries worldwide, the Cent-O-Gram balance offers high precision and remarkable value. The three-point base, special floating bearing principle and beam design eliminates the need for level adjustment. Zeroing is quickly achieved by means of a zero adjust knob at the end of the beam. With aluminum pressure castings for the base and beam assembly, agate bearings, steel knife-edges, and stainless steel pan, everything about the Cent-O-Gram and Dial-o-gram ensures a high standard of quality. Accurate and dependable, the original OHAUS Triple Beam balances have been the standard for decades and accommodate a range of laboratory and education applications. The OHAUS Triple Pro mechanical balance offers it all: The superior quality and durability you've come to expect from OHAUS, plus all the extras to satisfy every activity requiring a balance. Rugged and affordable, the OHAUS TJ611 Triple Beam Junior balance offers a solid track record of performance for a reasonable price. OHAUS Harvard Trip balances feature the advantages of magnetic damping, beams with sliding weights and a choice of weighing platforms. The Harvard Junior offers the combination of a colorful plastic two-pan balance with the durability and accuracy of the more expensive Harvard Trip, by incorporating a precision-engineered metal beam and zero adjust compensator. The OHAUS SB1200 School Balance is the ideal teaching tool to introduce children to the science of metrology. With a capacity of 2000 grams and a pivoting beam that provides accuracy to 0.5g, mass measurements can be achieved for a variety of classroom objects. 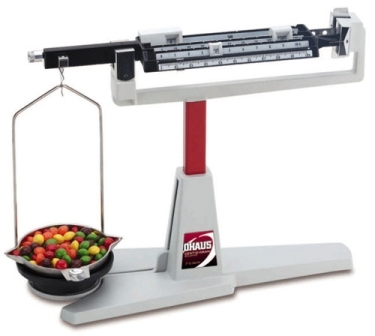 An inexpensive tool for teaching the basic concepts of mass and mass measurement, the PrimerTM Balance is easy to use and clean, yet sensitive to 1g. Each bucket has a volume of 500ml, which makes it ideal for many simple classroom experiments, with both liquids and solids. The Heavy Duty Solution Balance has set an industry standard for precision in high-capacity weighing. Durable enough to resist corrosion, this precise balance also weighs with a feather touch, down to 1g over the whole weighing range. The included slotted weights, stored in the base, extend the capacity to 20kg. The affordable OHAUS Field Test Scales are compact industrial scales that provide accurate weighings of a wide range of heavy materials in applications such as road construction, soil testing, archaeological digs, mineral analysis. The large, stabilized pan can hold oversized samples without tipping, and the weighted base keeps the entire scale stable for accurate results. Models in this range include the 311-00, 310-00, 119-DO, 2400-11, TJ2611, TJ611, 1650-00, 710-00, 750-S0, 760-00, TP2610, 1450-SD, 1550-SD, 1650-SD, HJ2001, SB1200 and 80410-00.